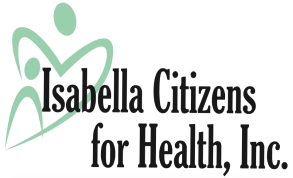 Resources - Isabella Citizens for Health, Inc.
ICH offers a Sliding Fee Scale Program available to qualified individuals who are under or uninsured. Call our office for more information. ICH participates in most insurance plans. Please call the Center for more information. You may view and print our Patient and Center Rights and Responsibilities here. We understand that information about you and your health care is personal. We are committed to protecting health information about you. We create a record of the care and services you receive from us. We need this record to provide you with quality care and to comply with certain legal requirements. This notice applies to all of the records of your care generated by our community health center, whether made my your personal doctor or others working in this center. This notice will tell you about the ways in which we may use and disclose health information about you. We also describe your rights to the health information we keep about you, and describe certain obligations we have regarding the use and disclosure of your health information. A full copy of our policy is given to each patient at the first visit or any time they request. You may also view and print our Notice of Privacy Policies here.